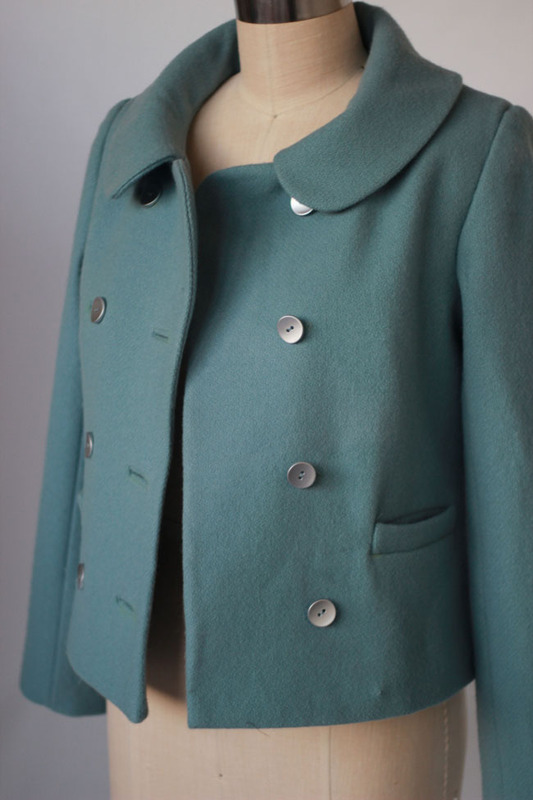 We are finally on the last stage of sewing our jackets! Today, we’ll be doing the lining. Lining a jacket is a bit of a process. We’ll be using a pretty straightforward technique that combines machine and hand stitching. 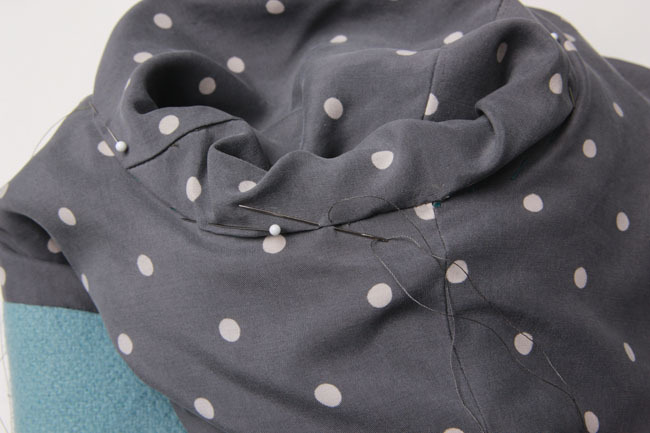 As you know, hand stitching is rarely quick, so be sure to give yourself time to do this. You might like to even do the sleeve lining and body lining on different days. 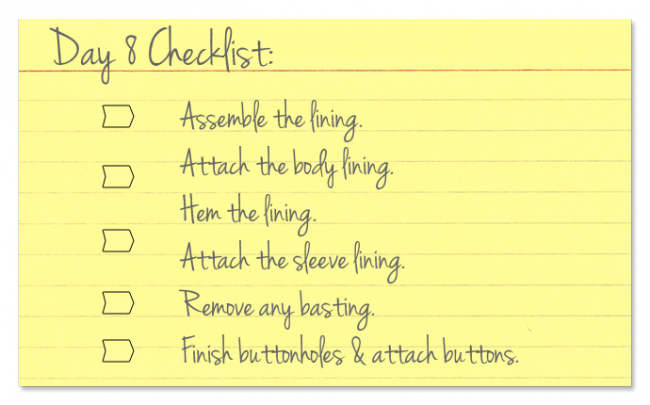 Finally, you’ll sew on the buttons and put the finishing touches on the buttonholes. That’s it! 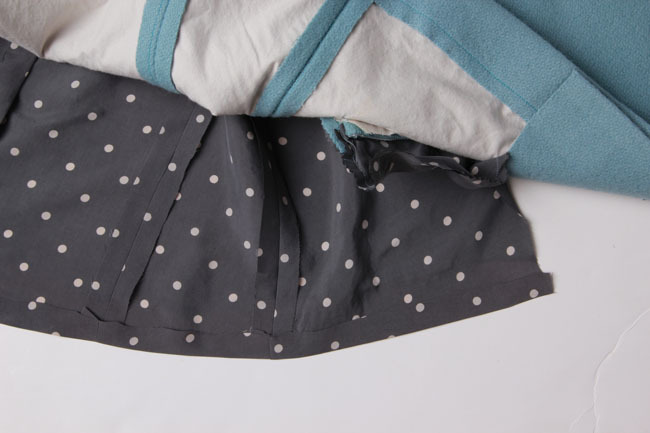 Fold pleat in lining center back (O) by bringing lines together, with wrong sides together and press. 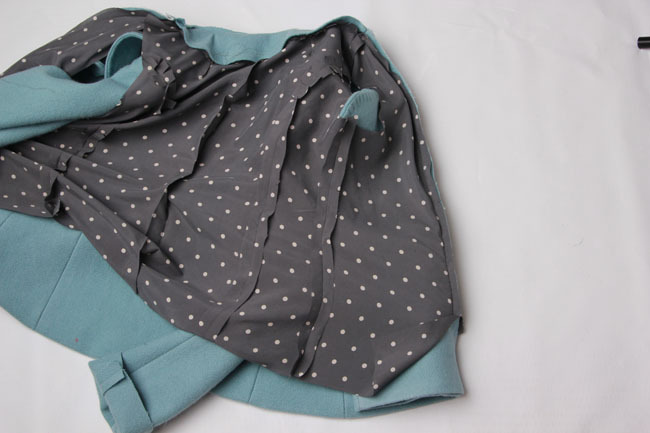 Creating a pleat in the back of the lining allows for easier movement when the jacket is worn. Stitch pleat for 2” at the top and bottom. 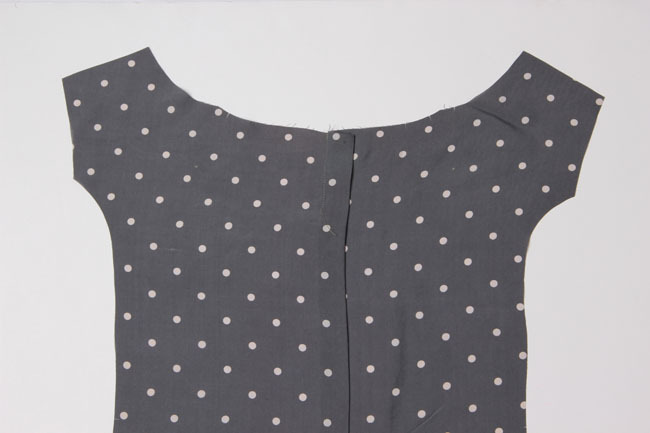 Stitch between circles at the waist. Press pleat towards the left. On lining center back (O) pieces, stitch darts in place. To do this, bring the dart legs together and stitch from the edge toward the tip. 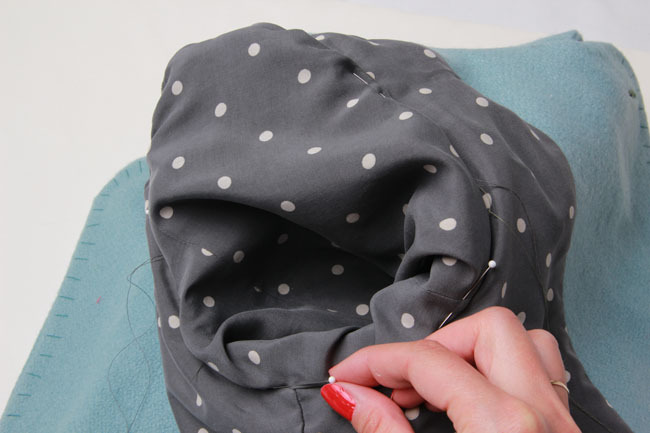 Tie off darts at the tip by sewing just to the edge of your fabric (do not backstitch), leave long thread tails, then tie the tails together at the tip. Press darts toward the center. With right sides together, stitch lining side back (C) to lining center back (O) at the side seams, just as you did for the jacket. Clip outer curves and press seam open. 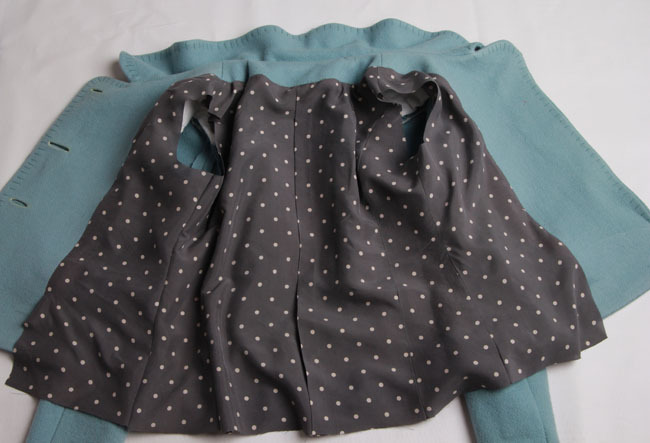 With right sides together, stitch lining front (P) to the back lining at the shoulders and side seams. Press seams open. Construct the lining sleeves just as you did for the jacket sleeves. 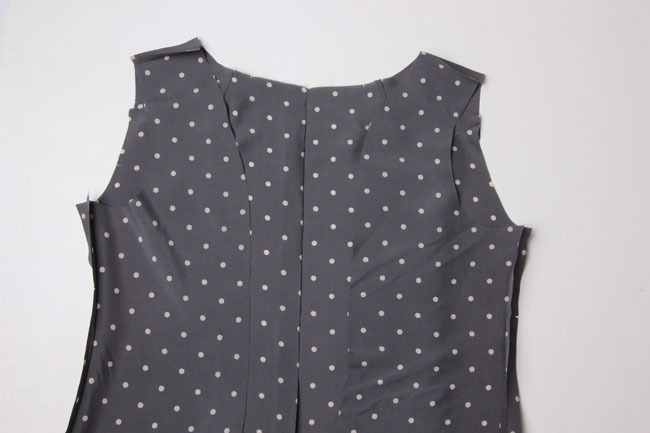 Begin by sewing the upper sleeve (M) to lower sleeve (N) at the front seam. Next, sew upper sleeve (M) to lower sleeve (N) at the back seam. Ease the lining sleeves as you did the jacket sleeves, but use only two rows of ease stitches, one 5/8” from the raw edge, and one 3/8” from the raw edge. Don’t insert the sleeve yet, only sew the ease stitches. 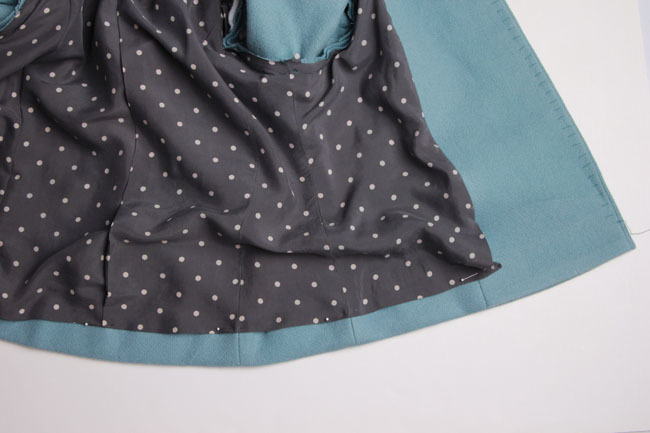 With right sides together, stitch lining to facing, stopping at the large circle, about 4” from the bottom of the hem. 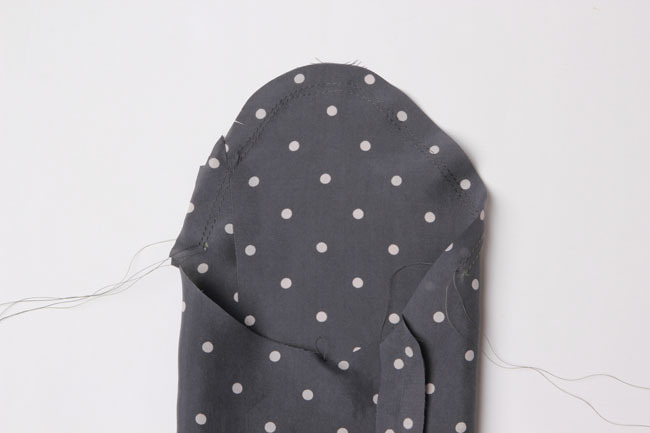 When stitching around the neck area, it can be helpful to clip the seam allowance of the back lining before stitching. 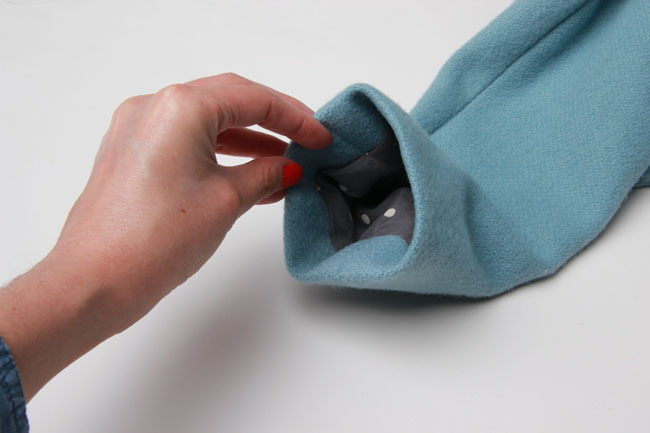 Turn the lining to the inside and press, as shown. Hand baste the lining to the armhole seam allowance, stitching through the existing stitching line 5/8” from the edge. Allow the jacket to hang naturally. Pin the lining in place 3 inches above the bottom of the hem. 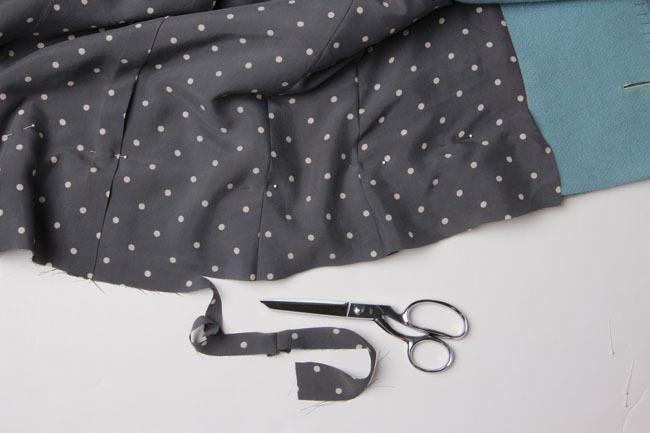 Trim the lower edge of the lining so that it extends 5/8” below the bottom of the jacket hem. Remove the pins. Turn the lining under 5/8” and press. Pin the lining fold to the hem, just below the raw edge of the hem. Slipstitch the lower fold of the lining to the jacket hem. 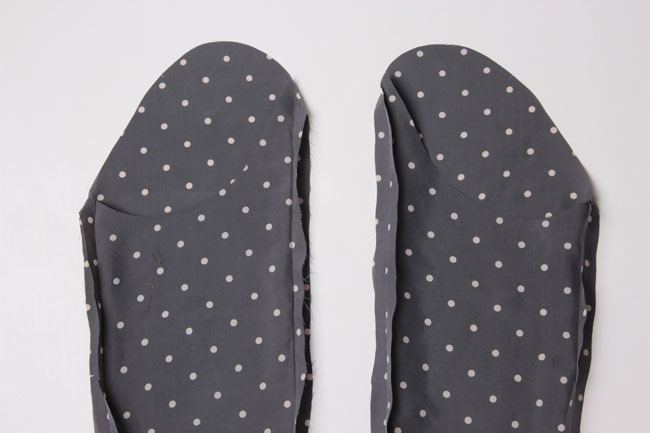 Allow the lining hem to fall down naturally from your stitching, forming a fold. Slipstitch the remaining gap at the edge of the lining to the facing. With right sides together, slip sleeve lining over the sleeve, matching the raw edge at the cuff. Stitch the sleeve to the sleeve lining at the lower edge. 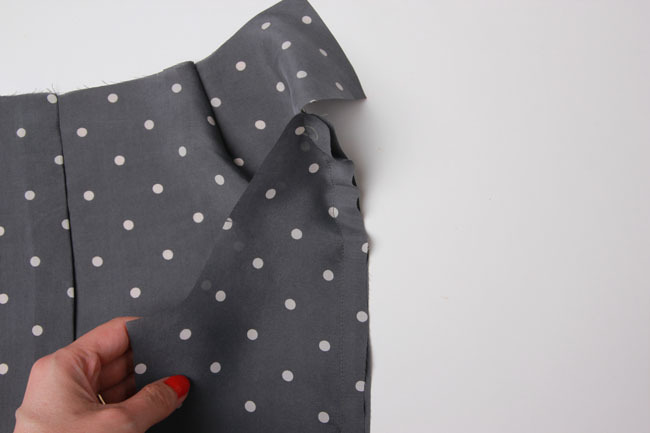 Turn the sleeve lining to the inside, pulling the sleeve under to form a 2” hem. Because the lining is shorter than the sleeve, pulling the lining to the inside naturally forms a cuff. Press the cuff. 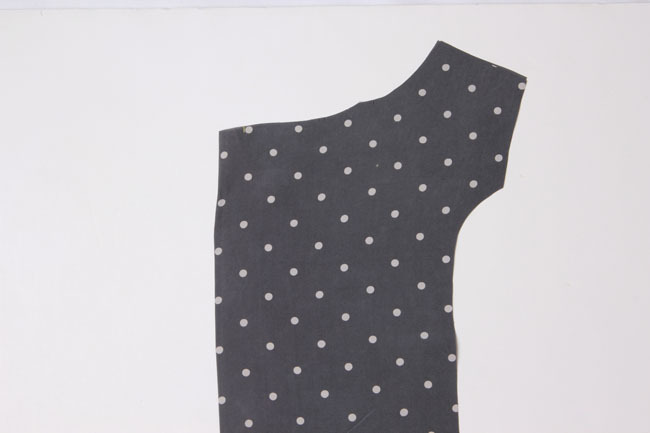 Pin the sleeve lining to the armhole, turning under the edges and adjusting the easestitches to fit. 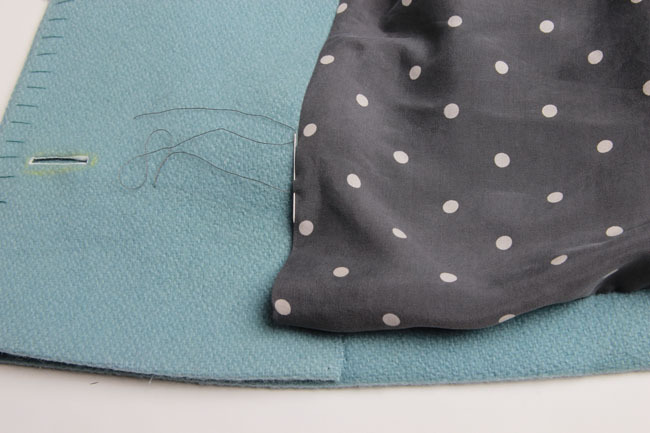 Make sure the sleeve lining just covers your basting stitches. 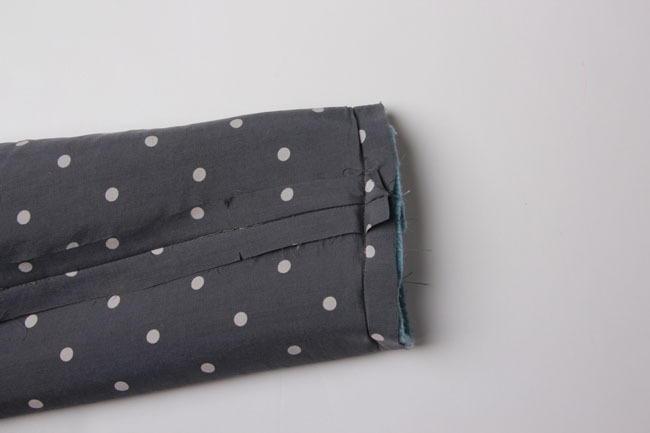 Stitch sleeve lining to body lining by hand, using a fell stitch. 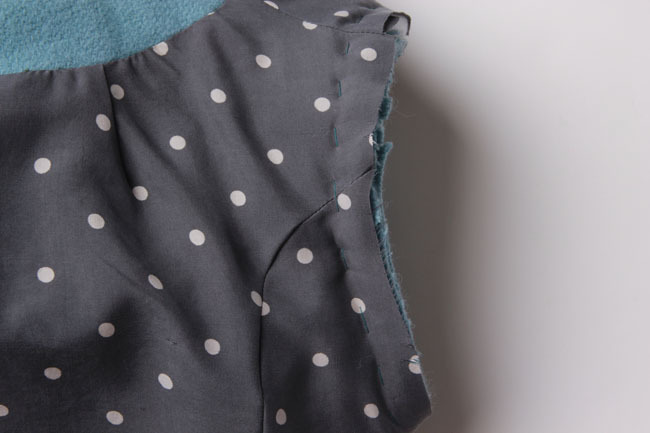 As you stitch, only catch threads from the lining rather than sewing through the garment. 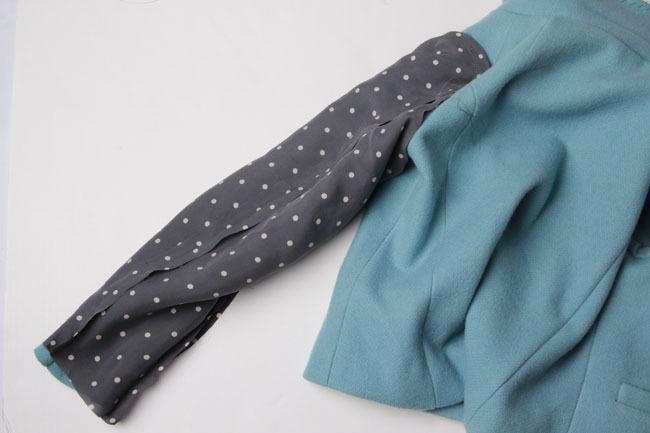 You are sewing the sleeve lining to the body lining only. 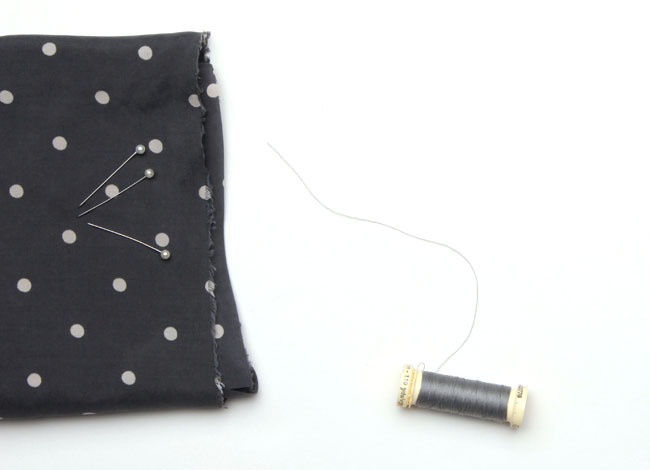 If you opted not to do bound buttonholes, now is the time to stitch your machine buttonholes. 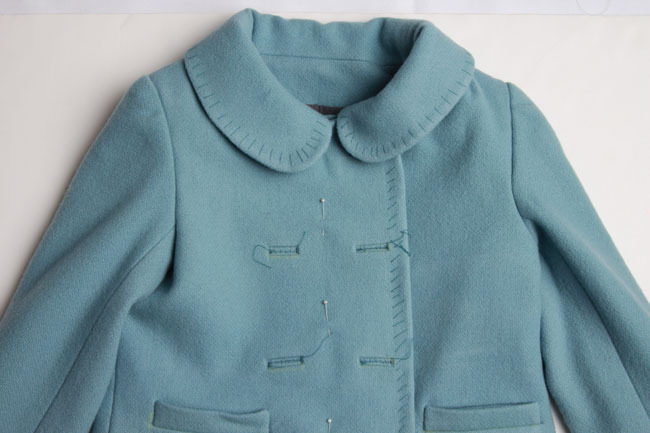 Stitch four buttonholes in place at placement marks on right jacket front (A). 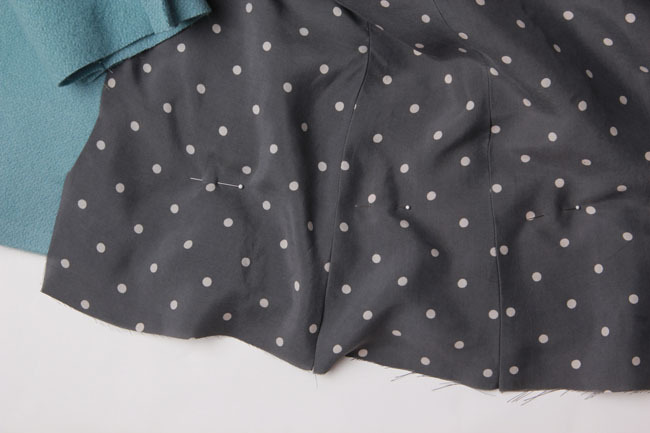 If you’d like, you can also sew decorative buttonholes at the placement marks. If you do this, don’t rip open these decorative buttonholes. You can simply sew your buttons over them later. If you created bound buttonholes earlier, it’s time to attach the windows in the facing to the buttonholes. Slipstitch the buttonhole windows in the facing to the buttonholes. Lay your jacket out flat and lap the front, matching up the center front line. Pin in place. 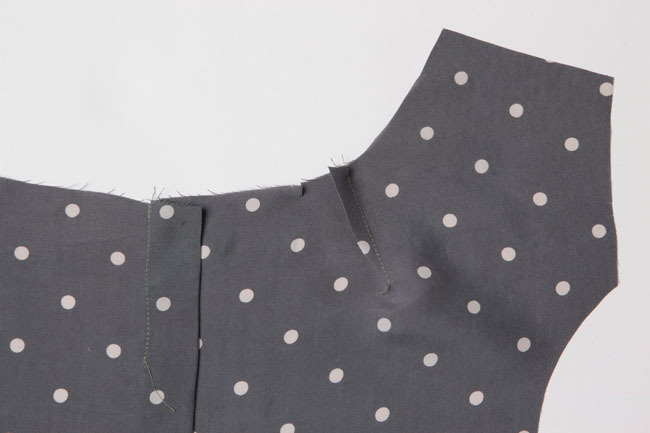 Insert a pin into each buttonhole to mark the placement of the button on the underlap. Lift the overlap away and mark button placement with chalk. Sew buttons in place. 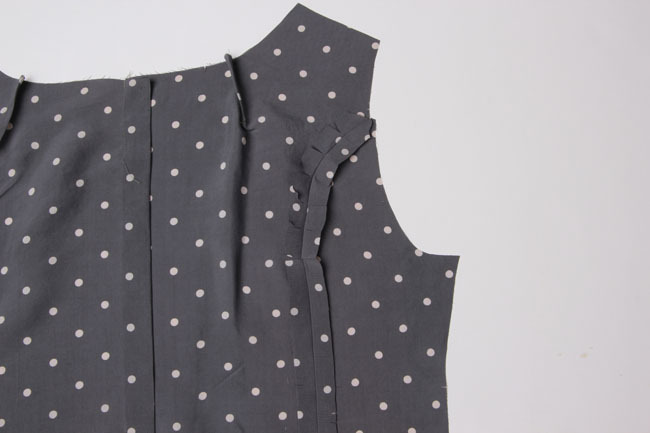 Use the pattern to mark the placement of the decorative buttons on the right side and sew in place. 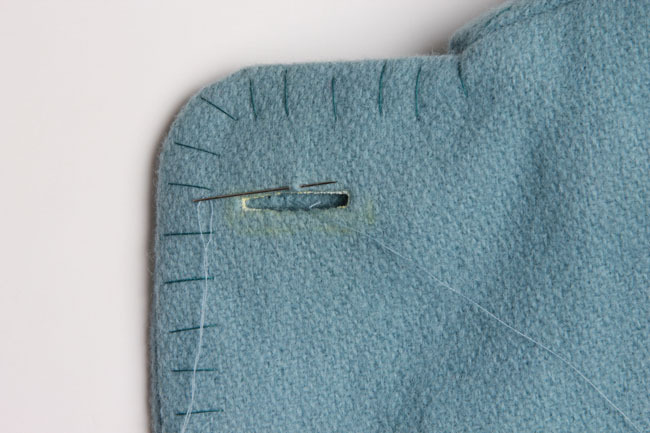 If you’ve made decorative buttonholes on the right side already, simply stitch the buttons on top of the buttonholes. Your jacket is now complete! Ok, I’m sure many of you still have a ways to go. Even though it’s been just about five weeks since we began, this sew-along has certainly flown by. Don’t worry if you’re behind. These posts will be here, and the companion is there to guide you too. I hope you’ll post your complete jackets in the Flickr group for the sew-along as well as the main Colette Patterns Flickr group! Will the whole sew along be posted? I wasn’t able to follow along, but would love to do the jacket! I’ll also plug the Anise Companion, which has all of the info clearly laid out in a single guide, with extra features (like making your own sleeve heads). I’m not making the Anise jacket but was at the end of another light coat pattern that was unlined. I decided to line it anyway so this post was well timed. I actually followed these instructions and the coat has turned out beautifully! Thank you so much! Yay – I’m finally caught up to this point and can start my lining today! It’s been fun to follow along and I have found the companion and the sew-along extremely helpful since this is my first jacket. :-) Thanks again for all this extra information and instruction! I wanted to share my finished object! I bought the pattern in October and stared at it longingly for a few months before getting to real action over the holidays. Thanks for a lovely pattern and a great new coat! Wow, thanks for making this mammoth task seem so easy. So is the bottom of the front facing not sewn to the bottom of the front panel? The facing is hand stitched to the hem in the previous lesson. I see why that’s confusing, though… it says to stitch the “corner”, which could be interpreted in a few ways. But the hem of the facing is supposed to be stitched to the hem of the jacket with a fell stitch. I’ll see if I can clarify that step.